The resurrection of Christ. 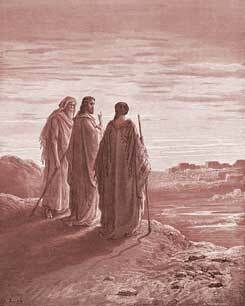 (1-12) He appears to two disciples on the way to Emmaus. (13-27) And makes himself known to them. (28-35) Christ appears to the other disciples. (36-49) His ascension. (50-53)1-12 See the affection and respect the women showed to Christ, after he was dead and buried. Observe their surprise when they found the stone rolled away, and the grave empty. Christians often perplex themselves about that with which they should comfort and encourage themselves. They look rather to find their Master in his grave-clothes, than angels in their shining garments. The angels assure them that he is risen from the dead; is risen by his own power. These angels from heaven bring not any new gospel, but remind the women of Christ's words, and teach them how to apply them. We may wonder that these disciples, who believed Jesus to be the Son of God and the true Messiah, who had been so often told that he must die, and rise again, and then enter into his glory, who had seen him more than once raise the dead, yet should be so backward to believe his raising himself. But all our mistakes in religion spring from ignorance or forgetfulness of the words Christ has spoken. Peter now ran to the sepulchre, who so lately ran from his Master. He was amazed. There are many things puzzling and perplexing to us, which would be plain and profitable, if we rightly understood the words of Christ. 13-27 This appearance of Jesus to the two disciples going to Emmaus, happened the same day that he rose from the dead. It well becomes the disciples of Christ to talk together of his death and resurrection; thus they may improve one another's knowledge, refresh one another's memory, and stir up each other's devout affections. And where but two together are well employed in work of that kind, he will come to them, and make a third. Those who seek Christ, shall find him: he will manifest himself to those that inquire after him; and give knowledge to those who use the helps for knowledge which they have. No matter how it was, but so it was, they did not know him; he so ordering it, that they might the more freely discourse with him. Christ's disciples are often sad and sorrowful, even when they have reason to rejoice; but through the weakness of their faith, they cannot take the comfort offered to them. Though Christ is entered into his state of exaltation, yet he notices the sorrows of his disciples, and is afflicted in their afflictions. Those are strangers in Jerusalem, that know not of the death and sufferings of Jesus. Those who have the knowledge of Christ crucified, should seek to spread that knowledge. Our Lord Jesus reproved them for the weakness of their faith in the Scriptures of the Old Testament. Did we know more of the Divine counsels as far as they are made known in the Scriptures, we should not be subject to the perplexities we often entangle ourselves in. He shows them that the sufferings of Christ were really the appointed way to his glory; but the cross of Christ was that to which they could not reconcile themselves. Beginning at Moses, the first inspired writer of the Old Testament, Jesus expounded to them the things concerning himself. There are many passages throughout all the Scriptures concerning Christ, which it is of great advantage to put together. We cannot go far in any part, but we meet with something that has reference to Christ, some prophecy, some promise, some prayer, some type or other. A golden thread of gospel grace runs through the whole web of the Old Testament. Christ is the best expositor of Scripture; and even after his resurrection, he led people to know the mystery concerning himself, not by advancing new notions, but by showing how the Scripture was fulfilled, and turning them to the earnest study of it. 28-35 If we would have Christ dwell with us, we must be earnest with him. Those that have experienced the pleasure and profit of communion with him, cannot but desire more of his company. He took bread, and blessed it, and brake, and gave to them. This he did with his usual authority and affection, with the same manner, perhaps with the same words. He here teaches us to crave a blessing on every meal. See how Christ by his Spirit and grace makes himself known to the souls of his people. He opens the Scriptures to them. He meets them at his table, in the ordinance of the Lord's supper; is known to them in breaking of bread. But the work is completed by the opening of the eyes of their mind; yet it is but short views we have of Christ in this world, but when we enter heaven, we shall see him for ever. They had found the preaching powerful, even when they knew not the preacher. Those Scriptures which speak of Christ, will warm the hearts of his true disciples. That is likely to do most good, which affects us with the love of Jesus in dying for us. It is the duty of those to whom he has shown himself, to let others know what he has done for their souls. It is of great use for the disciples of Christ to compare their experiences, and tell them to each other. 36-49 Jesus appeared in a miraculous manner, assuring the disciples of his peace, though they had so lately forsaken him, and promising spiritual peace with every blessing. Many troublesome thoughts which disquiet our minds, rise from mistakes concerning Christ. All the troublesome thoughts which rise in our hearts at any time, are known to the Lord Jesus, and are displeasing to him. He spake with them on their unreasonable unbelief. Nothing had passed but what was foretold by the prophets, and necessary for the salvation of sinners. And now all men should be taught the nature and necessity of repentance, in order to the forgiveness of their sins. And these blessings were to be sought for, by faith in the name of Jesus. Christ by his Spirit works on the minds of men. Even good men need to have their understandings opened. But that we may have right thoughts of Christ, there needs no more than to be made to understand the Scriptures. 50-53 Christ ascended from Bethany, near the Mount of Olives. There was the garden in which his sufferings began; there he was in his agony. Those that would go to heaven, must ascend thither from the house of sufferings and sorrows. The disciples did not see him rise out of the grave; his resurrection could be proved by their seeing him alive afterwards: but they saw him ascend into heaven; they could not otherwise have a proof of his ascension. He lifted up his hands, and blessed them. He did not go away in displeasure, but in love, he left a blessing behind him. As he arose, so he ascended, by his own power. They worshipped him. This fresh display of Christ's glory drew from them fresh acknowledgments. They returned to Jerusalem with great joy. The glory of Christ is the joy of all true believers, even while they are here in this world. While waiting for God's promises, we must go forth to meet them with our praises. And nothing better prepares the mind for receiving the Holy Ghost. Fears are silenced, sorrows sweetened and allayed, and hopes kept up. And this is the ground of a Christian's boldness at the throne of grace; yea, the Father's throne is the throne of grace to us, because it is also the throne of our Mediator, Jesus Christ. Let us rely on his promises, and plead them. Let us attend his ordinances, praise and bless God for his mercies, set our affections on things above, and expect the Redeemer's return to complete our happiness. Amen. Even so, Lord Jesus, come quickly. Can people who call themselves Catholic be saved?...yes, I do think so, can people who hold fast to the Catholic doctrine be saved?....I don't see any way they can be. Let every man examine himself with the Holy scriptures as the "only" standard. Catholics are not saved people. Trusting in Christ and Him alone is what saves. Everything about Catholicism teaches to trust in other things...Mary, Pope's edicts, confessing to priests, etc. I know because I came out of that. It's a filthy religion like all false religions. When a Catholic gets saved, they leave all that behind which would make them no longer Catholic. Maritza: No One is Saved by The Items You Listed or by the pope, priests or Their church. Salvation is Only by The Blood of The Lamb:(Hebrews 9:11-12, Revelation 1:5) I Talked with Many Catholics,most Said The Same Thing. The Church Will Take Care of Them, When they Go to Purgatory Someone Buys some Candles and Prays for Them. They do whatever The Pope Says. Is Their Church Ran by Devils? Christian's do not believe Catholics are saved because the, "Worship items of faith." I am not CATHOLIC, but answer this christian:Paul would pray over a piece of cloth and when the recipient open it, they were healed..what would YOU do with the cloth..It would be kept as proof, like an Ohmer of Manna, Aaron's budding staff, you would fault Catholics for this?!! Yes they are saved...!!! YOU ASK IF CATHOLICS ARE SAVED. I AM NOT CATHOLIC, BUT I KNOW THAT THERE IS EVERYTHING IN THE CATHOLIC BIBLE NECESSARY TO BE SAVED! 1. JESUS WAS BORN OF A VIRGIN. 2. JESUS IS GOD'S WORD MADE FLESH. JESUS IS GOD HIMSELF GOD IN THE FLESH. JESUS DIED ON THE CROSS FOR OUR SINS. 3. GOD RAISED JESUS FROM THE DEAD, STILL BEARING THE WOUNDS OF HIS CRUCIFIXION AND SAYING TO THOMAS, WHO DOUBTED . 46 And said unto them, Thus it is written, and thus it behoved Christ to suffer, and to rise from the dead the third day: 47 And that 'Repentance' and 'Remission of Sins' should be preached in his name among all nations, beginning at Jerusalem...........WOW, WOW, WOW! Verse 21~When Jesus was put to death his disciples were disappointed because they expected him to set up an earthly Kingdom. God's Kingdom is a heavenly Kingdom and so Jesus fulfilled prophecy by being put to death and resurrected to the heavens. What Do You Think of Luke 24? Which one of the apostles ran to inspect the tomb where Jesus was buried?